Ingmar Bergman's 1966 film Persona is currently my fourth favorite film of all time. An enigmatic story of a mute actress named Elisabet and a talkative nurse named Alma who live together temporarily at a beach house—as a kind of unorthodox treatment for the actress who has suffered some sort of breakdown during a stage performance of Medea—the film itself mimics many of the conventions of the theater: sparse sets, heightened dialogue, and a conspicuously artificial and uninhabited world. 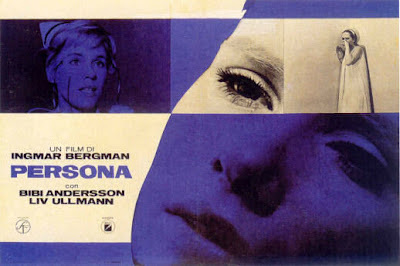 Persona begins (deceptively enough) as a straightforward, simple-seeming narrative, but gradually it too suffers a kind of 'breakdown.' At one point, it quite literally breaks down, as we see the film strip itself run off the spool of the projector and start to burn from the mechanical heat. Identities, motivations, and reality itself become confused. Elisabet's mute attentiveness and compassion are transformed into condescension and indifference. Her silence has become a provocation that leads to open antagonism—and a seeming collapse of boundaries between the two women's identities. I have animated the famous and pivotal scene from Persona in which Alma confronts the still-mute Elisabet with what she now knows (or understands) about her. Alma has essentially 'invaded' and ransacked Elisabet's identity and come away with her secret. She now throws the secret back in Elisabeth's face—but is it antagonism... or just part of the 'treatment'? In the original film, the part of Alma was played by Bibi Andersson, and the part of Elisabet was played by Liv Ullmann. In the dramatic recreation above, Alma is played by Brown Bear with Bows, and Elisabet is played by Bear in Purple Bunny Suit. Love this. Persona has dropped down the list, no? I don't think so. It's right around where it's always been. The top five has been pretty stable since the early 00s. I still haven't seen The Brown Bunny. 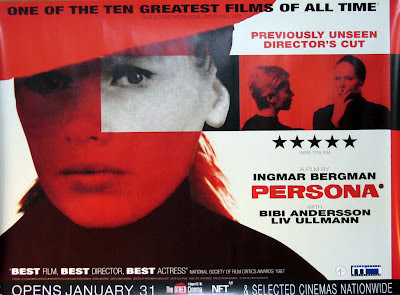 It's weird that Persona is one of the few Bergman films available on Netflix Instant Access. But I'm not complaining.